May 2nd, my colleague Piet van Dongen and I presented a Luminis Brain Upgrade on Quantum Computing. Below, you'll find a set of references we used during this Brain Upgrade, making you ready for the upcoming quantum storm! A large part is based on IBM’s Quantum Experience Beginner’s Guide and their Tutorial. Most of the practical examples of the basic gates were created using the online Editor, where you can build your own experiments, which can run on IBM’s real quantum computer! the notion of Bounded-Error Quantum Polynomial: problems that can be efficiently solved by a Quantum Computer, and checked very quickly. This notion comes from this paper. 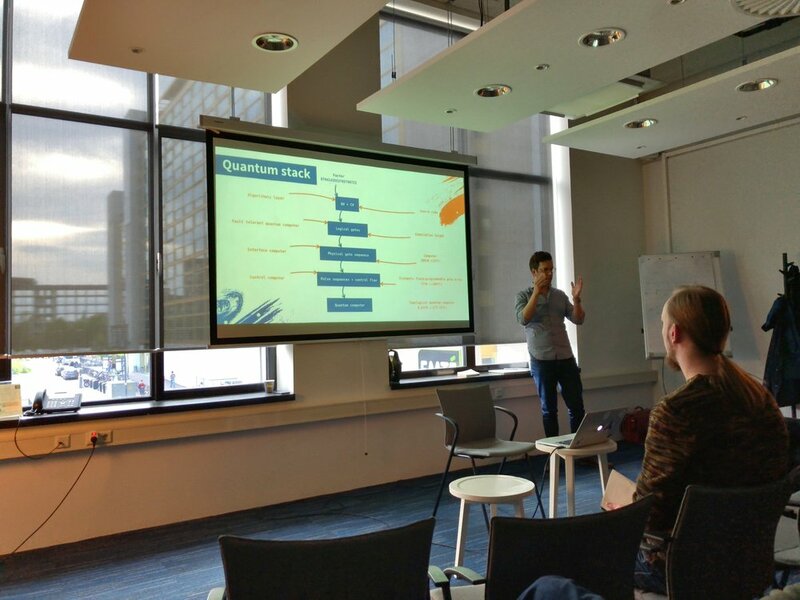 The algorithms we explored were programmed in Q# and C# using Microsoft's Quantum Development Kit (Preview): https://docs.microsoft.com/en-us/quantum/?view=qsharp-preview. The Bell State was based on the Q# quickstart example, see: https://docs.microsoft.com/en-us/quantum/quantum-writeaquantumprogram?view=qsharp-preview&tabs=tabid-vs2017. Quantiki has a nice explanation of the algorithm: https://www.quantiki.org/wiki/bell-state. Grover's algorithm came directly from Microsoft's Q# sample library: https://github.com/Microsoft/Quantum/tree/master/Samples/DatabaseSearch. IBM has a nice explanation of the algorithm here: https://quantumexperience.ng.bluemix.net/proxy/tutorial/full-user-guide/004-Quantum_Algorithms/070-Grover's_Algorithm.html. For the more visually inclined, I showed this: http://davidbkemp.github.io/animated-qubits/grover.html. Will I use quantum computing? Very likely. IBM, Microsoft and Intel are all working on different areas of the same problem (technology and research, programming model, and hardware, respectively), and since there are valuable speedups to be gained, it will touch your desk within the next decade. Will I need to herd thousands of qubits? No. You don’t wrangle billions of transistors now, we have better abstractions for that. Will I (or my company) own a quantum computer? Very unlikely. The workloads are very specialized, and the machinery requires expert maintenance. You will most likely rent capacity from some cloud provider. Are we there yet? Well, no. Current best efforts are at a few dozen qubits in a single system, whereas interesting applications require at least hundreds or thousands of qubits.